Picked it up Monday, seasoned yesterday, and doing a brisket today. My expectations have been well exceeded. I’ve been cooking on an OKJoe’s Longhorn for 4 years and Weber kettles for decades. 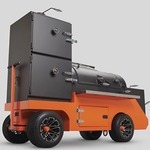 So I was ready to invest in a serious offset cooker, and one with more room for larger gatherings. I ordered the Kingman with a few customizations (ball valve on drain, probe port, and a welded in stack with opening lowered to main grate level). First impressions: the cooker is a truely majestic work of art. It is also a beast - getting it off the trailer and moving it around to the back yard was a great workout for my son and I. The modifications were executed beautifully. It is definitely something I am proud to have on display - it’s just that level of craftsmanship. Bravo, Yoder! But even better is how well it performs. I will primarily be using it with the heat management plate removed so it cooks top down. I was blown away with the seasoning cook. The thing draws like nobody’s business! The velocity of the airflow out of the stack is hard to believe - like there is a powered fan inside. So I will actually be experimenting with shutting down the flow some with the stack damper - that is something I’d never thought I’d have to even think about. And watching how using the firebox damper affects the heat distribution within the cook chamber - this is just plain fun and will give so many cooking options. Also immediately obvious how easily and steadily it cruises along holding steady temps. Just a completely different animal from what I have grown used to. And yes, the wood usage is waaaay down. I was holding steady 275 for 60-75 minutes between adding a single split. I couldn’t be more satisfied with the decision to invest in the Kingman, and I couldn’t be more impressed with Yoder. 4th of July will be memorable this year!